I write this review not out of any sense of obligation to Ayn Rand's legacy; nor do I write it to spite the many film critics who reviewed the film negatively. In my view, what matters when it comes to a film is whether I enjoy it. 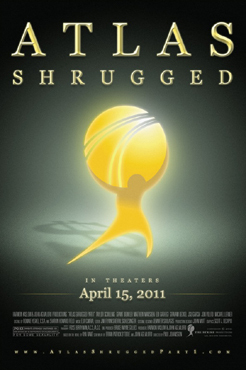 When I saw Atlas Shrugged: Part I, I did indeed enjoy it. It is impossible to overlook the very existence of this movie as one of its accomplishments. Through the financing of John Aglialoro and the direction of Paul Johansson, a film was created that neither Ayn Rand herself nor numerous renowned directors and producers over the past 40 years were able to bring to fruition. In the face of the continual barriers and challenges that impeded the development of an Atlas Shrugged film, the fact that I was able to sit in a theater and enjoy such a film is itself a testimony to the power of human productivity and creativity. Aglialoro and Johansson exemplify the best of rational individualism in approaching this elusive challenge with determination and tackling it their own way — even filming all of it in a mere 27 days to ensure that Aglialoro's rights to make such a film would not expire. (For those interested in how the first Atlas Shrugged movie came to be, Brian Doherty provides an excellent glimpse into some of the people and events surrounding the making of this film.) What Aglialoro and Johansson brought forth is worthy of admiration for its own sake, though, of course, it is not beyond constructive criticism. Despite time and resource limitations, the creators of this movie accomplished an impressive feat. The Atlas Shrugged: Part I movie may not be complete or comprehensive in reflecting the first third of Ayn Rand's monumental novel, but what movie could be? To compress over 300 pages of intense storyline and sophisticated ideas into 97 minutes would necessitate omitting some of the richness of the novel. I, for one, would have preferred a slightly longer film that incorporated more of Rand's original elements: the childhood flashbacks of Eddie Willers and Dagny Taggart, the story of the 20th Century Motor Company as actually told by one of its former employees, and the encounters that Eddie Willers unknowingly has with John Galt himself. In places, the movie does feel rushed, and John Galt's appearances seem rather forced for this reason. If the film had, as the book does, provided a smoother transition to Galt's utterances — instead of the sudden "Do you want to live in a society that values individual achievement?" — the effect would have been more compelling. The characters that have a more frequent presence on the screen, though, more closely approach Rand's portrayals. Throughout both the book and the film, I find Hank Rearden, not John Galt, to be the protagonist with whom it is easiest to identify. Grant Bowler's portrayal of Rearden does him justice as a creator of value who comes, through a process of philosophical discovery, to recognize the greatness of what he does. "Atlas Shrugged: Part I is an engaging and visually interesting depiction of the beginning of one of the most significant fictional works of the twentieth century. If it can please knowledgeable readers, while drawing in others and inviting them to read the book, then it will have made a valuable contribution to the world of ideas." While some have considered awkward the setting of the movie in the near future (2016-2017), given the numerous technological changes that occurred between 1957 and today, this criticism misses a crucial component of Rand's message: that societies can and do go backward when individualism, productivity, and innovation are stifled. One does not have to look long to find entire centuries — indeed, a whole millennium in Europe from the Late Roman Empire to the Early Middle Ages — of technological decay. Given accelerating inflation and stifling federal restrictions on energy production, prohibitively expensive fuel costs could be in our future. Air travel is already intolerable due to the molestations visited upon millions of travelers by the Transportation Security Administration. If there were a nice, gleaming railway made of Rearden Metal today, enabling abuse-free long-distance travel throughout the United States, I would use it eagerly in preference to both flying and driving. Indeed, I would be willing to pay handsomely for the privilege. As for the film's portrayal of the John Galt Line, the graphics and cinematography were spectacular. The train-run sequence was just as I had imagined it when I first read the novel almost nine years ago. Given that history did not hold still during the prior failed attempts to produce an Atlas Shrugged film, anyone who tried making this film would have had to contend with the challenge of adapting the story to a more current setting. For a film where the creative power of inventors and industrialists is celebrated, it is important for the technology developed by these creators to be at the cutting edge in the minds of the film audience. At the same time, it is important for an Atlas Shrugged film to adhere closely to the novel it seeks to portray, so as not to dilute Rand's art and her important message. The makers of this film were able to accomplish both of these objectives competently, without sacrificing one or the other. In essence, Atlas Shrugged: Part I is an engaging and visually interesting depiction of the beginning of one of the most significant fictional works of the twentieth century. If it can please knowledgeable readers, while drawing in others and inviting them to read the book, then it will have made a valuable contribution to the world of ideas. That is enough to overlook the film's imperfections and to hope that we will be able to see Parts II and III in movie theaters soon.